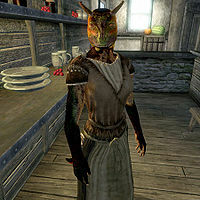 Witseidutsei is an Argonian publican and the innkeeper of the Five Claws Lodge in Leyawiin. Witseidutsei sells food and rents beds, and prides herself on keeping her establishment clean, which may be part of the reason she does not appreciate certain individuals making a mess in her tavern. Her taking pride in keeping the inn clean shines through when you meet her for the first time: "Welcome, stranger, to the Five Claws. Food and beds, cheap and good, but most of all, your hostess promises, always clean! Witseidutsei gives you her guarantee! Everything, clean, always, or you do not pay!" She is also very fond of Count Marius Caro and his wife, Countess Alessia Caro, despite the fact the Countess hates Argonians. When asked about Leyawiin, she will tell you more about her cleaning fixation but will all of a sudden change the subject: "So much dirt, and so little time... pause but a moment, and you'll be drowned in the tide... Trash! Mud! Dust! We all love Count Marius, and his father before him... Arkay bless his soul... such a fine young man. And now, his new wife, so beautiful, so fine. And wise? Oh, yes! The new Lady Leyawiin is daughter to Countess Arriana Valga, County Chorrol, and so she knows just how the county should be run. Lady Alessia tells Count Marius exactly what to do... and he does as she says... But listen to me! Cawing and chattering like an old fishcrow..."
As you approach Witseidutsei after you are given the duty to investigate reports that your Fighters Guild guild-mates Rellian, Vantus Prelius, and Dubok gro-Shagk are causing trouble will have her demand that you get your guild-mates to calm down. "You must make them stop!" Speaking to Witseidutsei will have her demand that you remove your fellow guild members from the inn. "You're Fighters Guild! Get them out of here!"' Asking her about the guild members causing trouble will have her explain the problems they've been causing for her: "Causing trouble, yes. Causing much trouble. Scaring customers. Breaking furniture. Bad, bad men." Asking her about the Blackwood Company will have her reply: "They have caused trouble here as well. But they have gold to pay for the trouble. Things are always better when served with gold." If you end a conversation with Witseidutsei before you find new work for your guild-mates, she will once again demand that you take care of your fellow guild members: "Make them go away!" While the guild members are still causing trouble she will randomly hurl various insults and demands at you and them until they are satiated by getting new jobs: "All of you! Out! Now!" "Nothing more for you, Imperial! Get out!" "You're paying for all of this!" "Leave here now, Redguard!" "You scare off my customers. Go away!" "I'll never let an Orc drink here again!" "Dirty Orc! Get out!" "Filthy Orc! I smell you from here!" "Get your men out of here!" "Stop these maniacs!" "You make them leave!" "Get them out of here!" Once you find new work for your fellow guild members she will greet you by saying; "It's about time someone did something. These guys are killing my business!" Asking her about the trouble makers now will have optimistically claim that she believes the trouble may be over: "Perhaps they will cause no more. Perhaps they will have the gold to pay for their drinks." Witseidutsei wears random selection of lower-class clothing and also carries with her a meager amount of gold. Witseidutsei will serve the tavern her entire life, without eating or sleeping, until the drunken Fighters Guild members come. She'll then either stand far away from them or go and argue with them.